Today I wanted to take a look at a top seller from a really well known quality hiking boot company, Lowa. Specifically, the Lowa men's Renegade GTX Mid Hiking Boots. I recently bought a pair myself so thought I'd add some of my thoughts up on them. To learn more about the ladies version of the Lowa Renegade GTX. Probably more appropriate for 3 season use as opposed to 4 season but the Renegade Mid GTX hiking boots are still an excellent choice for the day hiker. Let's start with how these boots look. Overall they look a decent pair of hiking boots and sit easily on the eye. There are a lot of colors to choose from so you should be able to find something in there that suits your taste. Lowa have been in the hiking boot making business for a long time, over 90 years I believe. With that in mind, the first thing to mention about this boot is that, to the best of my knowledge, it is Lowa's best seller and has been for some time. That's quite an accolade for the Renegade in a company with that kind of long and illustrious history. That alone is usually a pretty good indication that you can expect a certain level of quality from them. While the relationship between every foot and boot is unique and specific, I still think popularity is a good starting point yardstick to use when selecting which boots to take a look at when you're on the market for one. I know myself that among my fellow hikers, we regularly discuss hiking products, what's good, bad, etc. so word of mouth has an important role to play in the success of a boot. I took the plunge a few months back and got myself a pair and I have to say they have not disappointed. So, with that in mind, let's get into the detail. The footbed in the Lowa Renegade II GTX Mid boots for men is climate controlled. This effectively means that the boots have the capability for moisture to be wicked away from your feet. This is really good to have and it is an often overlooked feature in hiking boots. Moisture and heat coupled with friction and movement open the door to one thing, a blister! Definitely not what anyone wants to have to deal with while they're out on the trail. Form my experience, in terms of comfort some points of note were that first off, there was more or less zero break-in required, they were good to go out of the box. Always handy to have but what I would expect with this style of boots. I have worn the Renegade now on various types of terrain e.g. rocky mountains, wetlands, etc. To date I am very happy with them in terms of comfort. The boots are breathable and they perform well in this area from my experience with them. The Renegade are also waterproof and again they perform pretty good in this department, they have a limit though. For example, if you hike in a lot of wetlands, I think you would probably be better with something that bit sturdier, probably a tough Alpine style leather boot. Overall, if I would have one main concern about these boots, it would be there waterproof capability in tough conditions. The Nubuck leather upper holds your feet firmly and securely in place and so reduces strain on your toes on descent. The boot is also reasonably lightweight coming in and around 3 pounds (1.4 Kgs), and utilizes monowrap midsole technology. The nylon shank provides stability and ankle protection with the shaft measuring 5" from the arch. The Vibram outsole, pictured below, on the Renegade features thick, nonslip rubber lugs which provide that all important extra traction on the trail. This is really important when it comes to hiking over wet and slippy obstacles in tougher conditions. Overall, I've been very pleased with the grip provided by the Renegade Mid GTX boots. From wet stone to slippery mud, they've performed well and I've no complaints. Vibram outsoles always tends to be pretty good. Finally, the Derby lacing system means that Lowa Renegade GTX Mid hiking boots can be adapted to fit most folks feet. Good adaptability is a must have for a new pair of hiking boots, especially when you're first breaking them in. The shape and make up of this boot are good for average hiking and light backpacking needs i.e. probably not suitable if you're planning longer trekking and backpacking trips. Overall I think these are a decent day hiking boots ideal for hiking in late Spring, Summer and early Autumn where the weather is a bit warmer. They could well be used as a year round hiking boot though, depending on where you like to hike i.e. paths and trails, you should be fine. As of the date of this post, from about 100+ reviews I checked out, across multiple retailers, 80% gave the Lowa Renegade Mid GTX boots 4 stars (out of 5) or more, so some great scoring! 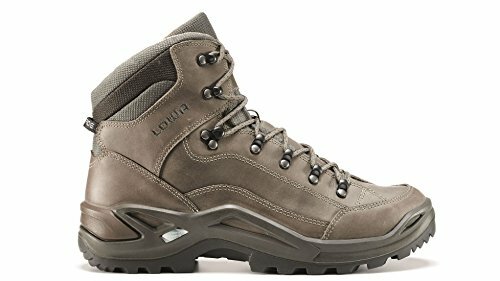 Overall I really like the look of the Lowa men's Renegade II GTX Mid Hiking Boots. They have a lot going for them and they have most of the main functional things I would look for in a light hiking boot. If you're an average hiker doing mainly day hikes, sticking mainly to trails and less rugged terrain in generally temperate or warm conditions, these boots should meet most of your hiking needs all round. They're probably versatile enough for short backpacking trips and for staying dry while walking across town too. If however, you're heading into a lot of very steep and rocky terrain or more challenging conditions, I would probably look for something with a bit more ankle support and general protection features. All in all though, they look like a great pair of hiking boots! If you're still unsure what type of hiking boots you should get, check out the hiking boot buying guide and our hiking boot recommendations.